I feel like Rudolph the red nosed reindeer! My nose is red and sore and I have been sneezing like a fool. I woke up with a sore throat that has thankfully improved. 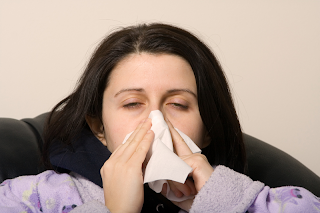 If this sounds familiar then you too have been afflicted with the seasonal cold. I am thankful that it isn't worse, but I really feel crappy! I guess I am in for another week of this if it follows the normal course. What is it? ... fluids, Vitamin C and aspirin or Tylenol. There is a cough but not too bad yet. Oh, yes! The other thing, plenty of sleep! Now if my nose would stop running I might get some sleep. Any one got some chicken soup? Oh, the picture isn't really me. It IS how I feel!